Located in Peterborough and comissioned by a Brick Manufacturing Company, this purpose built jackleg cabin now provides a much needed, additional welfare facility to this busy industrial plant. This jackleg cabin provides a total floor area of 20 sq. m and incorporates 2 No. male toilets as well as a separately partitioned and fully equipped disabled toilet. A separate shower area is also provided. This prefabricated jackleg unit measures 7.30x2.70 m and is located within a large industrial unit. Internally, the walls and ceilings are finished in easy to maintain vinyl faced plasterboard whilst the floors are finished in 2mm Polysafe standard vinyl. This prefabricated building is fitted with electric LST heaters to maintain the facility at a constant temperature. Externally, the walls and fascia of this jackleg building are finished in low maintenance stipple texture - the colour being of the clients choice. The roof is constructed with a mono-pitch flat roofing system and covered with a hard wearing 'Hypalon' blanket c/w square section uPVC rainwater goods. 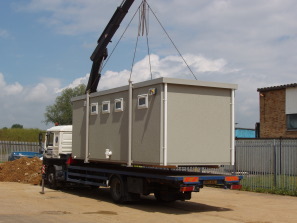 This jackleg toilet unit was delivered to site and off-loaded using a lorry c/w hiab crane and located in its final position with the aid of a forklift truck and trolley jacks. Disruption on site was kept to an absolute minimum and the whole installation process took only one afternoon.